Home » HARRIMAN, EDWARD H.
EDWARD H. HARRIMAN (1848-1909). One of the great railway builders of all time, Harriman was known for his genius in developing and turning around failing railroads, including the Union Pacific. His stock market battle for control of the Northern Pacific against J. Pierpont Morgan and James J. Hill, which ended in a standstill, remains as one of Wall Street's great wars. A true financial wizard, Harriman was known as the "Napoleon of Wall Street" and upon his death, controlled more millions than any financial giant of the country. 1901, Illinois. 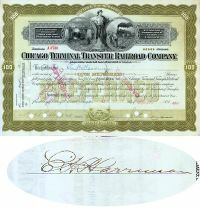 Stock certificate for 100 shares of the Chicago Terminal Transfer Railroad Company. Olive/Black. Engraved vignette of standing liberty flanked by steam locomotive scenes. Issued to and signed on verso by EDWARD H. HARRIMAN,(1848 - 1909). Railroad executive, Financier. One of the great railway builders of all time, Harriman was known for his genius in developing and reinvesting in railroads. His stock market battle for control of the Northern Pacific against the combination of J. Pierpont Morgan and James J. Hill (which ended in a standstill) remains as one of Wall Street's great wars. A true financial wizard, Harriman was known as the "Napoleon of Wall Street" and upon his death, "controlled more millions of capital than any financial giant of the country." A highly attractive and scarce Harriman variety. Punch cancellations not affecting Harriman’s signature. Fine. 1901, Illinois. 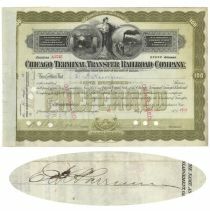 Stock certificate for 100 shares of the Chicago Terminal Transfer Railroad Co. Green/Black. Engraved vignette of standing liberty flanked by two steam locomotive vignettes. 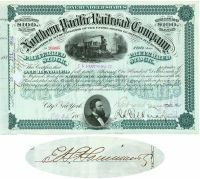 Issued to and signed on verso by EDWARD H. HARRIMAN Railroad executive, Financier. One of the great railway builders of all time, Harriman was known for his genius in developing and reinvesting in railroads. His stock market battle for control of the Northern Pacific against the combination of J. Pierpont Morgan and James J. Hill (which ended in a standstill) remains as one of Wall Street's great wars. A true financial wizard, Harriman was known as the "Napoleon of Wall Street" and upon his death, "controlled more millions of capital than any financial giant of the country." Stamp and punch cancellations not affecting Harriman’s signature. Very Fine. 1885, New York. Stock certificate for 100 shares. GreenBlack. Engraved vignette of a steam locomotive at top center, nice portrait vignette of Frederick Billings at bottom. Issued to E. H. Harriman & Co. and signed on verso for the company by EDWARD H. HARRIMAN(1848-1909). Railroad executive, Financier. One of the great railway builders of all time, Harriman was known for his genius in developing and reinvesting in railroads. His stock market battle for control of the Northern Pacific against the combination of J. Pierpont Morgan and James J. Hill (which ended in a standstill) remains as one of Wall Street's great wars. A true financial wizard, Harriman was known as the "Napoleon of Wall Street" and upon his death, "controlled more millions of capital than any financial giant of the country." Stamp and Punch cancelled and Excellent..